A few days ago, me and my friends ate at Tempura Japanese Grill. This would be my third time reviewing this place on this blog, if I’m not mistaken, and I still won’t be reviewing the “grill” portion of this place, sadly. However, I’m still pretty stoked at what I will be reviewing for this entry. I guess this week sort of becomes a revisiting week of my favorite Japanese restaurants, hoping they still deserve the praise I gave them before. So, what is it that makes me excited about this entry? Well, after the many times I’ve visited this place, I’m finally able to try out their often unavailable dish that I’ve been dying to try out. Yes, I’m finally able to order their Ebi Bacon Maki (250 Php). That alone, I believe, deserves an entry in itself. But since it was my first meal for that day, I also ordered their Ebi Hamburg Katsudon (235 Php), for a double dose of shrimp. Yes, after more than a year of coming and going, my highly-coveted and Beloved-recommended Ebi Bacon Maki arrives hot and freshly-prepared. This simple dish has three simple ingredients—asparagus, shrimps, and bacon. The first two are of generous amounts wrapped in a single piece of the latter ingredient. All this was topped in a deliciously sweet sauce. What can I say? This is the best single dish I’ve had in a while, topping even the delicious Spider Maki I recently tried at Omakase. Every piece was filled with the crunchy asparagus, firm shrimp, and chewy bacon. The sauce deserves praise on its own, making my friend’s bland tofu dish actually flavorful. It certainly meets my expectations, perhaps even exceeding them. 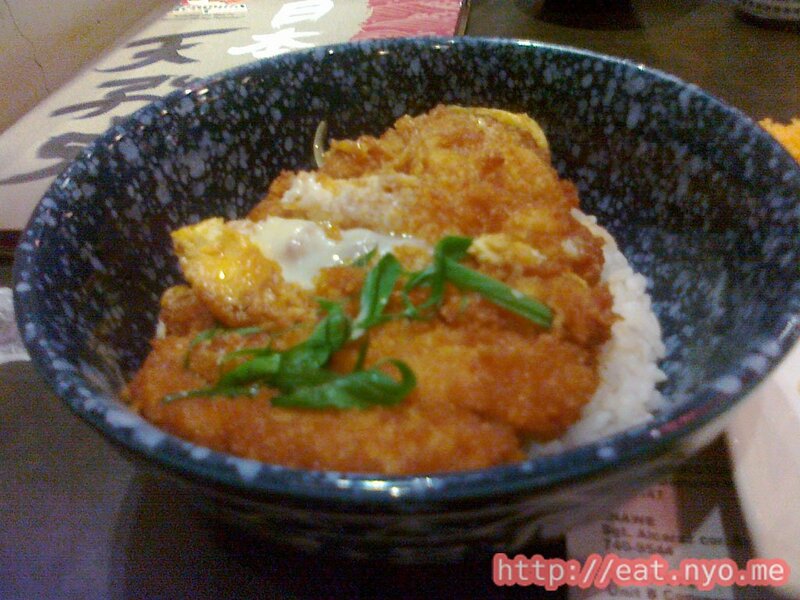 While the Ebi Bacon Maki already made my night, my main order, the Ebi Hamburg Katsudon deserves some mention as well. This one-of-a-kind dish basically a patty of pure shrimp, breaded, and deep fried, then topped with egg to finish. It has the texture of a katsudon, but has that distinct shrimp flavor. Surprisingly, this turned out very good as well. I still wasn’t able to try out the grill portion of this place. But I really don’t see the need to. The price of their yakiniku turns me off when dishes like these are available—especially if the Ebi Bacon Maki is available. And since no other place I know of serves something like this—either lacking the “ebi” part or the aspargus, or is wrapped in something other than bacon—I still have my reasons to go to Tempura Japanese Grill. Recommended for: Bacon-wrapped stuff lovers, tempura lovers. 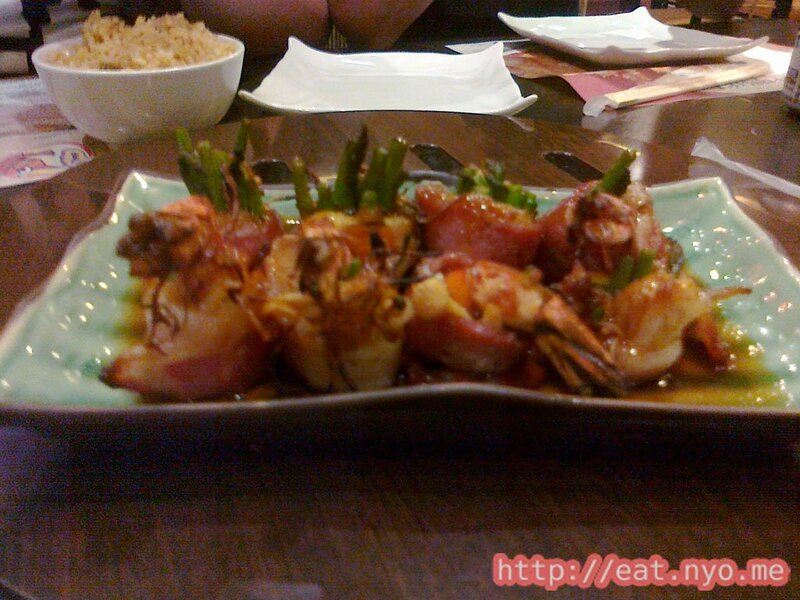 Smart nomnomnom tip: The Ebi Bacon Maki, order it.